It's always nice to put faces to forum members! So I'll start...is the absolute legend dressed as Barf from Spaceballs out there anywhere? Amazing costume! Thanks for the photo!! While I was waiting for Rey Mysterio noticed three people dressed up as Bray Wyatt, CM Punk and AJ Lee. Really cool costumes! The group of Disney princesses? Spider-gwen that was there Saturday? Anyone else see this? On level 3 on Sunday afternoon, two Walking Dead cosplayers were recreating a fight scene while someone recorded it. They kept repeating the same part where one of them gets thrown to the ground, managing to hit bystanders in the process a few times from what I saw. Everyone around me that was resting/eating at the time was getting really annoyed by it. Yup of course I can :-) I will try to get it up soon for you then. Hi everyone. I was wondering if someone could help me. I met 3 lovely people on Sunday, one of which was someone called Anneka who was there with her brother and friend from Milton Keynes. we both had diamond passes for MJF I think her number was 229.We hung around for a little while talking about BTTF. We separated for awhile and planned to meet at the BTTF talk.But unfortunately I never saw them without saying thanks and goodbye. I also remember her brother used to be a postman and she used to help him. Any help would be appreciated. My email address is alan.bradley72@hotmail.co.uk. 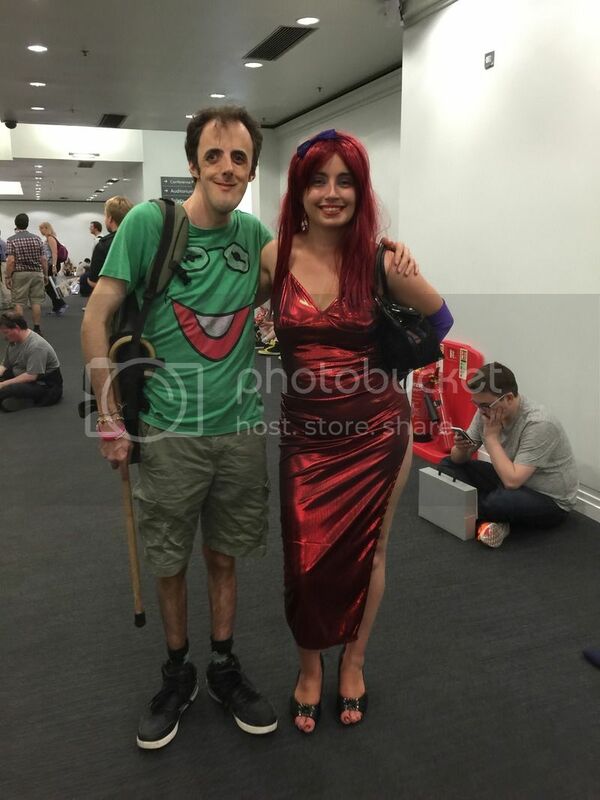 Saw a great Jessica Rabbit cosplay (can't remember which day it was), her costume was spot on. there had been two Jessicas. a taller and a shorter lady. As posted in the photo thread, there was a girl with an amazing Rogue cosplay that I missed getting a picture of. Would have loved to have complimented her on the outfit. I was chatting to a guy next to me in the GP queue on Sunday (as you do) and he turned out to be Wrong Name. Met lots of nice people at the convention in the que for the photo shoots and in the gold pass room thank to everyone who chatted to me as I was on my own for the weekend. 1 guy who I got chatting to in the que on Sunday morning for 3 hours saw him later in the day and saved me a place in GemmaWhelan que. 2 a lovely lady who I sat next too in the Christopher Lloyd talk chatted like I'd know her all my life lol. Shame I had to leave early.